The text below this print identifies the actor, the role and the artist. "Many of kabuki's domestic dramas were adaptations of actual events. In 1702 at the Yotsubashi in Osaka, a dealer in second-hand goods named Hachirôbei murdered Otsuma, a prostitute in the Tanbaya teahouse. This spawned — as was the custom for sordid or shocking tales that caught the fancy of the public — songs and dramas about the ill-fated couple. Edo and Osaka each produced its preferred versions of the story, with occasional conflations of similar real events (unbelievably, one in Edo involved a prostitute named Ginneko Otsuma slain by vendor of dry goods named Hachirôbei!). 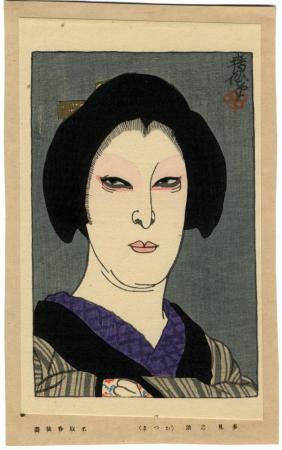 Many of the Otsuma Hachirôbei mono portrayed Hachirôbei as especially despicable and included scenes in which Otsuma engages in aisozukashi ("becoming sick of something"), a kabuki convention in which a woman verbally abuses a man without looking directly at his face as she rejects his advances." This is #191 in the Natori Shunsen (名取春仙) exhibition catalogue from Kushigata in 1991.